If the Kickstarter fails, Shawn Jackson claims those who donate via PayPal will get their cash back. 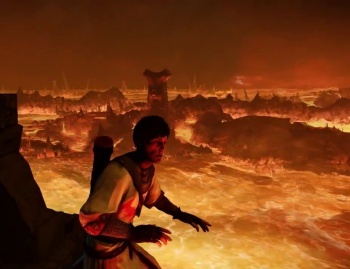 Shawn Jackson, COO for Precursor Games, the studio that's currently trying to raise cash for its Shadow of the Eternals episodic horror title, has taken to Reddit for an AMA. Its Kickstarter has raised, at time of writing, only $115,224 of its $1.35 million ask, with 18 days to go. Meanwhile Precursor's own - completely separate - PayPal crowdfunding effort has raised $272,584, nowhere near the $1.5 million Precursor was originally shooting for. No doubt this causes concern for Precursor, but the folks on Reddit had their own worries. What was the deal with Nintendo, publisher of Eternal Darkness: Sanity's Requiem when Precursor's people still worked for Silicon Knights, and would it get on board if the crowdfunding campaign went south? What was Jackson's response to the Kotaku article alleging all kinds of crazy on Denis Dyack's part? Why was Dyack on board at all, bearing in mind past history? According to Jackson, Precursor has been in constant contact with Nintendo "and they have been supportive," but nothing's been said about Shadow. Nintendo still holds the Eternal Darkness IP, so Precursor's Shadow is a spiritual successor, not a sequel. That's why you won't be seeing, say, Mantorok - Corpse God of Eternal Darkness - in Shadow; Nintendo still owns his sinister carcass, so he could only appear with Nintendo's permission. Jackson didn't let much slip as far as alternative funding models went, but he was quick to promise that if things went wrong with the Kickstarter, even those who pledged via PayPal to Precursor's own funding effort would get their money back. Wih regard to the Kotaku article that causes so much grief Dyack felt obliged to respond with a video statement, it "focussed on a very few negative opinions from few disgruntled employees," according to Jackson, and wasn't the full Silicon Knights picture. None of the allegations are true, Jackson says; certainly they aren't an accurate reflection of his time there. As for Dyack, why shouldn't Precursor hire a designer with 20 years experience in the industry running his own studio? Precursor believes in Dyack, and hopes that by keeping him on the creative side of things will let him excel at something he loves. "We didn't anticipate a backlash [when we hired Dyack]," Jackson claims, "because we actually know Denis as the person he is." Whether or not tactics like this AMA will dispel the stigma surrounding Dyack is an open question, but it seems unlikely, given the time left to run and the gulf between what it needs and what it has, that Precursor will reach its funding goals. When that happens, it had better have some kind of backup plan ready to roll, else Shadow may remain insubstantial forever.